In this post I'll play the role of nerdy Martha Stewart. Specifically I'll toss out some ideas on decorating one's cubicle. I'll start with this alien janitor. I got it at a now-defunct SoHo store called KidRobot, but it's available online too. On to a different robot, Bender from Futurama. And yes, they also sell a Gender Bender for those who are into that. I got the thing pictured below at the store of the Museum of Modern Art. It's Japanese and made from one of the nicest-feeling materials I've ever touched. Dead Fred pen holder. This is the thing I've gotten the most comments on over the years from coworkers. A toothpick dispenser. The picks are both his teeth and his hair. 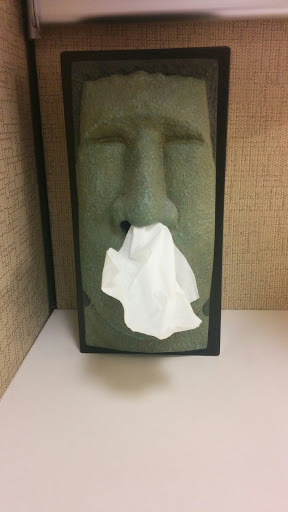 Continuing with the theme of usefulness, an Easter Island-like tissue dispenser. 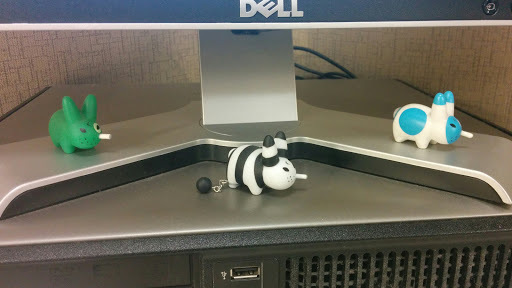 I actually hesitated before putting it up in my cubicle. Could this conceivably be called politically incorrect? It's been there for at least 3 years now with no complaints though. A couple of pics of my Smorkin Labbits. This calendar is from the MoMA store. Unfortunately they don't sell it in this color scheme anymore. The yellow ball is attached to the horizontal bar by a string. It's held up in this state by magnets hidden behind the names of the months. And finally a Domo figurine. I put it inside an overhead shelf that's closed most of the time. Whenever I open it he looks like he's shouting "why did you shut me up in here?" Then I get the paper I was looking for and close the door again.